Starbucks is a chain of stores that sell coffee. A chain is many stores owned by the same company. Many of the stores look the same, and all stores sell the same items, often at the same prices. As well as coffee, Starbucks sells beverages and baked goods. 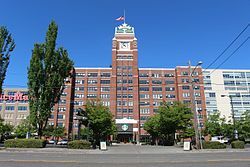 Starbucks started in Seattle in the United States in 1971. The number of stores has grown quickly. There are over 9,000 Starbucks stores all over the world. Most of these stores are in the United States. Some large cities in the U.S. have many Starbucks stores. Sometimes they open so many stores in one city that there are two Starbucks within a few blocks of each other. Starbucks sells many kinds of drinks. There are 5 sizes: short, tall, grande, venti and trenta. There are many ways to customize each drink. A frappuccino, for example, is a cold drink. Flavored syrup and cream is added to coffee or juice and stirred with ice. Some stores sell special items, such as mugs related to the city they are located in. The first Starbucks in Japan opened in Ginza in 1996. There were 985 stores in Japan in 2012. ↑ 1.0 1.1 1.2 "Starbucks Corporation 2013 Fiscal Report, Form 10-K, Filing Date Nov 18, 2013". Retrieved February 21, 2014. ↑ "STARBUCKS CORP 2013 Q1 Quarterly Report Form (10-Q)" (XBRL). United States Securities and Exchange Commission. January 28, 2014. This page was last changed on 9 August 2018, at 10:20.